The weather has been beautiful of late and we have had a lot of visitors to the shop. Had a family of three generations visit yesterday. They were from Rhode Island and had a lot of fun looking for agates on the beach. They actually found some! I had a lot of fun showing them my lapidary equipment and even managed to drill a nice crazy lace pendant for them. 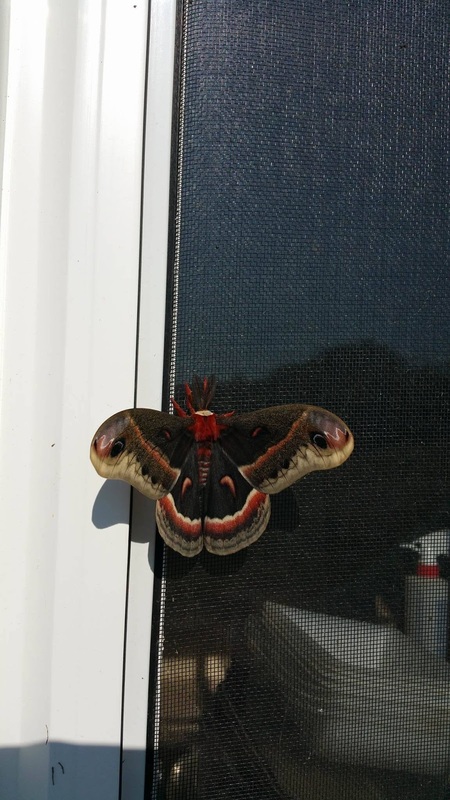 Apparently it is some kind of giant silk moth and the largest of these guys has a wing span of 6 inches. I measured this one and it was a little over 6 so I think you may be looking at a world record!! The patterns and colours are absolutely spectacular! I've sold a lot of my agate specimens lately so I will have to get busy and make more. I have some beautiful stuff ready to cut and polish and Vickie and I are collaborating on a necklace that just might be amazing! Beautiful day today, not a cloud in the sky and warm with just a zephyr of a breeze! Too nice to work but perfect for drinking a beer and listening to some J.J. Cale on the deck. So that's it for now. Come on by and see us and if you haven't visited Nova Scotia, what's keeping you? The Bag Lady is Back! So all the threats and wine bribes have finally paid off. We have had a tremendous run on Vickie's bags and with our inventory down to two the walls were looking pretty bare. So I finally convinced her to get out her fabric, thread and machines and get to work! You will note that she appears to be sewing in stereo! Anyway, as you can see, the inventory is up to 5 and she promises me that if the wine keeps coming the wall will be full by the end of tomorrow. So if you haven't seen these bags, you owe it to yourself to swing on by. They are absolutely gorgeous and a steal at the price! Even though it was cold and rainy today, we had visits from tourists hailing from Rhode Island and Massachusetts. Some beautiful Seawall Fibres Obsidian worsted is heading across the border! We will be attending a convention in Halifax so for this week only, the store will be open all day Monday and Tuesday but will be closed from Wednesday and will reopen the following Wednesday morning. The Verdict is In on Seawall Fibres! We have now had our beautiful Seawall Fibres hand dyed yarn in the shop for a few weeks and it has been a real eye opener for me- a non-knitter. "...a yarn addict (and yarn snob). Your yarn is orgasmic!" "I couldn't wait to get home to sit and enjoy the softness and colours of these yarns..."
"...a lovely store with a nice selection of different weights of yarn." " It's soft and squishy and the colours are amazing." "...the St. Mary's Bay blue is calling my name. Just need to find the right pattern for the gorgeous yarn." 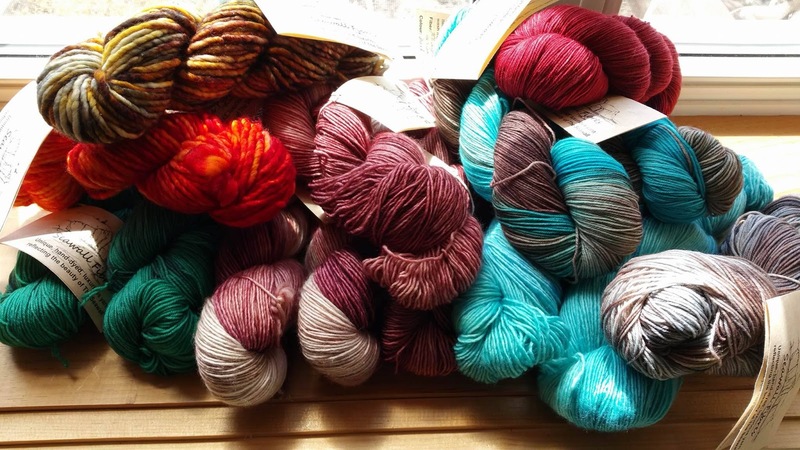 "The yarn colours are outstanding! As beautiful as they are seeing them online, they are even more beautiful in person." "...what a gorgeous selection of gorgeous colours! Can't wait to get one of these on the needles." "I fondled and probably drooled just a little..."
Needless to say, sales in the shop have been brisk and this week alone, through our Etsy Shop, we have shipped yarn to Sweden, Ireland, England, the USA and even Canada! So if you are a knitter, you owe it to yourself to check out Seawall Fibres! And now a word to you long suffering non-knitters who know a serious knitter (we'll call it SK). In the words of ex President Clinton, " I feel your Pain!". When I was in the golf business, I was convinced that golfers were the worst fanatics known to man. When I got into the sunglass business I met the surfing community. I thought they were the worst fanatics. We sold to bass fishermen. Who but the world's biggest fanatics would spend tens of thousands on a bass boat which is basically an open skiff with a seat in the middle and a honking big motor on the back and then enter a tournament and stuff their fish with lead weights to win? I say that because I have now met SK! SK enters a yarn store and starts to drool. Read the above quotes people! SK doesn't just knit yarn, SK has an intimate relationship with it. SK has a "stash" of yarn. If your SK has say, 50 skeins, they can still be saved. I've seen worse- a LOT worse! Vickie's stash is so big that if she dies before me I can sell it and move to Tahiti. Heck I could BUY Tahiti! So if your SK says "I want to go to The Artist's Mark to look at the yarn, they are LYING! I suggest you bring a good book or hang out with me in the rock shop. In the time it takes SK to fondle every skein in the store before buying (and trust me, SK WILL buy) I can teach you to be a first class lapidary! Oh, did I mention that rock hounds are the biggest fanatics in the world...? We have been extremely busy of late with stuff fairly flying off the shelf! Our inventory of Vickie's popular purses stands at 2 but she has promised me that if I make dinner for a few days she will make some more. The worst part is since she has celiac disease I can't make Kraft Dinner. 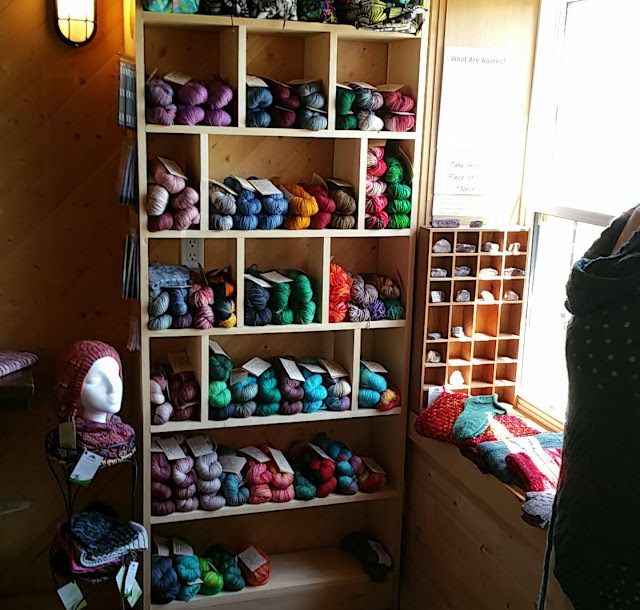 We finally got the last of Lisa's initial shipment of yarn tagged and priced so I think we now have about 110 hanks of wool in our display. So there's plenty to drool over for all you knitting fanatics out there (you know who you are!). Or if that isn't your cup of tea, you can also follow us on Facebook and Instagram! Once we get the shop restocked, our plan is to restart our Etsy shop for The Artist's Mark but until then, if you want to see Vickie's abstract art and gorgeous jewelry, my rock specimens and silver pendant collection featuring local gem stones or Sandra's famous whimsical sculpted figures, you'll just have to come and see us on beautiful Digby Neck- the whale watching capital of the maritimes! If you mention the blog, I'll give you a nice piece of tumbled agate or Jasper.